Leave it to Target to sell the perfect faux leather cap at an affordable price ($15). I started getting into the sporty-chic look last summer, so I wanted to translate the trend into winter. This cap merges elements of sport and fashion, and it is easy to wear on a casual day. I seriously have a weakness for almost anything in faux leather. I'm sure you've noticed I have another weakness for Zara. This is yet another all-Zara look... sorry! I purchased this sweater from their winter sale because it can be worn at several times throughout the year. Being in New York, I usually only experience heat in from June-August. Since this sweater is lightweight, it's a piece I can style throughout the chillier remainder of the year. I will definitely be styling it with shorts once the weather hits the 70s! It's an easy piece to wear because you can rely solely on the graphics. No jewelry or accessories needed. The "jersey" number and racing stripes are enough to give your outfit an overall vibe. What do you think of athleticism in fashion? Let me know in the comments below! Hey Christina! Thanks for checking out my blog! This look is super cute! 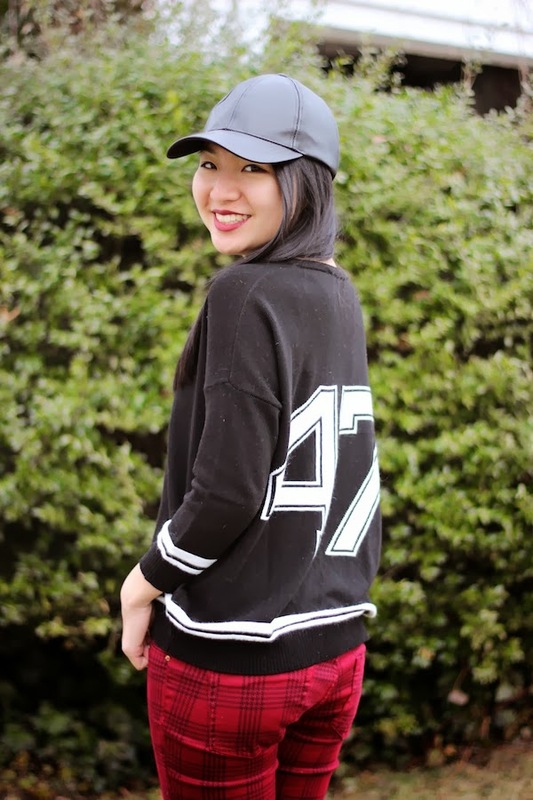 I love how you created this outfit from an athletic inspiration into a chic girly look! Take care and have an incredible day love! Love this look! i love the different elements from the jersey type shirt to the hat and booties! just amazing! Hi love! Do you have a blog? I've been clicking on every commenter's profile to check out their blogs, but I can't seem to find yours! Love the overall look! The heels are fabulous. I love how the hat is casual and chic at the same time. Love the sporty look and that plaid pants. So casual but chic love. I absolutely love a sporty vibe. I love the shoes too, saw it just yesterday at Forever 21 and almost bought it myself! Love that last shot, so cute! And that cap does look just perfect!